I currently serve as the Vice Chair of Ways and Means, a Member of Elections and a Member of the Federal Relations committees. The first order of business was ensuring Arizona met the federal government’s January 31st deadline for the intrastate Drought Contingency Plan (DCP) and tax conformity. The governor signed DCP and vetoed conformity. Today the public made it extremely clear: they no longer trust the failed dysfunctional leadership of the City of Phoenix. Phoenix leaders demanded a whopping $1.5 BILLION water tax increase, one of the largest in city history. This was voted down on a 5 to 3 vote, with Councilwomen Guevara, Mendoza, and Stark voting for the tax increase but Mayor Williams indicated she plans to bring it back for reconsideration later. Tried to force a $50 Million per year tax on medicine, crying we will lose police if we don’t pass this new tax. Luckily, it did not pass. Wasted $10 million to study garbage. Gave an insider developer $700,000 worth of public property for a mere $50,000 in an insider-deal. Lied to the south Phoenix community about the effect of light rail on their neighborhoods and businesses. Poured millions into membership dues for government staff. The fact is, Phoenix is experiencing more revenue than it ever has before in its history as a city and still city officials cry that we can’t pay for critical functions of government. Every time they run out of money to waste, the politicians claim hardship and demand more money. When everything is labelled a crisis, nothing is a crisis. In fact, the only crisis I see here is a lack of public trust in dysfunctional city leadership. My heart goes out to Laura Pastor and the Pastor family on the passing of her father, Congressman Ed Pastor. Congressman Pastor served the people of Arizona with dignity and honor throughout his life. Though we disagreed on many things, partisanship stops well short of this point. Congressman Pastor’s accomplishments will carry forward far beyond his lifetime. I only hope the certain knowledge of that legacy and the impact he had on so many people throughout this state and across the country can provide some small comfort to his family in their time of grief. Republicans made big gains in the Senate, ensuring a lock on judicial appointments and Democrats made gains in the House, ensuring a slowdown of the Republican economic and social agenda. Republicans maintain control of the states in the legislatures and governorships across the country. Democrats have not even begun to regain the 1100 seats they lost during the last administration. At the end of Tuesday night’s Scottsdale City Council discussion referring a solid package of important community improvements to the November 5th ballot there was applause from the good number of people in attendance. It was unusual, and refreshing to hear. It symbolized how various members of the public and council, who often disagree on issues, all came together for Scottsdale’s greater good. What preceded this, however, was noteworthy. During public comment Jason Alexander discussed the need for the bond but then alluded to potential opposition because a majority of the council was making too many bad land use decisions, in his opinion. Alexander is, of course, a potential, formidable City Council candidate in 2020 and is now a grassroots organizing Hall of Famer for his noble and ultimately successful crusade against the ill-advised Desert Discovery Center. Indirectly, Milhaven took Alexander to task later in the meeting discussing the inappropriateness of threatening the bond package because of disagreements elsewhere. We concur. Milhaven noted her disappointment, even strongly, with some of the elements in the bond package. But in the end she was going to support it because of its necessity. Over the past number of years Alexander has gone from a bomb thrower to a top-tier candidate for City Council. Some might even call him a favorite for 2020. And that’s happened because Alexander didn’t just prevail on the biggest electoral issue in the city in the past many years, but because the Princeton graduate has been smart and measured, opposing some things, supporting others. He understands that Scottsdale doesn’t ultimately reward people who say no to everything. Those people may win battles. They lose wars. It’s shocking and sad that Scottsdale voters have not backed a meaningful bond measure to fund community infrastructure in two decades, despite public opinion polls showing residents believing the city is headed in the “right direction” rather than the “wrong track” by substantial margins. A key reason for failed bond programs past was a house divided. The City Council was never unanimously in support of a package and opposition resulted. It was as if nobody on the dais could learn the basics of democracy, compromise and cut deals. But so much losing and pronounced community needs produced a different result last night as Mayor Jim Lane and the Scottsdale City Council came together to do right by Scottsdale. On November 5th Scottsdale voters will be given the chance to ratify a package of compromise and collaboration of some $319 million. Ironically, since Scottsdale has not passed a bond in so long property taxes will still be going down even if the measures pass because of the retiring bonds funding the projects ratified twenty years ago. Scottsdale has some turbulent days and elections ahead. But on Monday night the City Council stood as exemplars, coming together to do what the people expect them to. Linda Milhaven. Kathy Littlefield. Guy Phillips. Suzanne Klapp. Virginia Korte. Solange Whitehead. Jim Lane. On this issue they truly were #ScottsdaleAtItsBest. Scottsdale is a very special city and its northern reaches have a lot to do with it. There, lower densities prevail in an almost rural environment with the McDowell Sonoran Preserve anchoring its distinct character. Recent years have seen numerous rezonings and increasing densities come to parts of the area. That’s not necessarily bad, but does it mean those who want to accentuate larger lots, bigger view sheds and a more sensitive approach to the land should be dispatched? No. Cue Cantabrica Estates. There, at 118th and Jomax, a part-time Scottsdale resident bought 27 acres for larger lot homes to enjoy the lower density lifestyle and views of Tom’s Thumb, Four Peaks and the best Scottsdale has to offer. Falling in love with the land he sought no zoning changes and was intent on investing $35-$40 million to bring to life the existing zoning in a beautiful, sophisticated way. Then along came a speculator, on a narrow, ten-acre parcel next door, immediately to the east. A year ago he introduced plans to triple density from 3 homes allowed on the ten acres, the same density as Cantabrica, to 9 homes. Anyone who has walked the land will know how offensive the notion is. Undulating desert. Significant boulders. It’s just wrong to pork it up as proposed. Fortunately, Scottsdale City Councilmembers when made aware of the request expressed dissatisfaction. A “three-quarter” vote has been even been filed by adjacent property owners forcing the developer to get a supermajority of five votes. But rather than do the right thing as Cantabrica Estates and many other enthusiasts of true “rural neighborhoods” have espoused, this developer has dug in. His high-profile attorney has told people he feels confident in getting the five votes. That’s a curiously, bold statement. We are not aware of a single supporter of the application, only opposition by numerous, leading north Scottsdale voices. Downtown Scottsdale merchants have played an extremely critical role in our city’s economy for decades. The art galleries that line the streets in the Arts District attract tourists from across the world and are embedded in the fabric of Scottsdale’s culture. Though each gallery and store in the Arts District sells different wares, one thing does unite each merchant: they face an issue with a shortage of adequate parking for their clients. In an editorial that was published earlier this week in The Scottsdale Progress, French Thompson, the president of the Scottsdale Gallery Association, explains why the parking shortage may be exacerbated if Museum Square, a project that will convert the abandoned Loloma transit station into a magnificent mixed-use master plan development between Scottsdale’s Museum of the West, Stagebrush Theatre and Scottsdale Artist’s School, moves forward. We’re unabashed supporters of it. Joining us in our support of this groundbreaking project are several of Mr. Thompson’s gallery brethren, including the Larsen Gallery and the Legacy Gallery, and the Scottsdale Gallery Association itself. Macdonald Development Corporation, the company behind Museum Square, recognizes the impact that the project could have on parking in the vicinity. Instead of ignoring vital voices like Mr. Thompson’s, Macdonald is stepping up, taking the initiative and doing all it can to answer their questions, even though the primary obligation belongs to the City of Scottsdale. Finding a parking spot in downtown can be migraine-inducing. However, Museum Square won’t contribute to drivers’ headaches. In fact, Macdonald Development Corporation, the company behind Museum Square, may even provide the ibuprofen we need by helping to cure the situation. Before we get into the parking solutions, we want to reintroduce a phrase of historic significance to help settle everyone’s nerves. 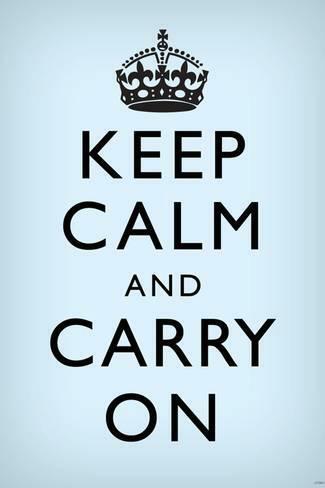 That phrase is, “KEEP CALM AND CARRY ON.” This was the same advice the British government imparted upon its citizens after the outbreak of World War II and posters bearing the message could be found everywhere across Great Britain in the early 1940s. This rallying cry played an important role in ensuring that pandemonium did not break out in British cities. What steps is Macdonald taking to address parking challenges? They truly are extensive. That’s not a refrain you often see municipal elected officials put on re-election brochures. Yet, that would be the truth were anyone on the Paradise Valley Town Council to actually vote for the density dog that has become the proposed redevelopment of the SmokeTree Resort near Scottsdale and Lincoln. Recently, the Town of Paradise Valley Planning Commission had the foresight to reject the supersized SmokeTree. That’s because its proposed density far exceeds that deployed to redevelop the old Mountain Shadows and La Posada sites in Paradise Valley, or what the Ritz-Carlton project was able to muster for its large, vacant site. And DensityTree’s plans dwarf what was done next door to revitalize the old Cottonwoods Resort into the beautiful Andaz property. Once upon a time, a former owner of Cottonwoods saw intensities like those now proposed for SmokeScreen. But councilmembers before said “no” and the benefits to all are now obvious. Look, there is a time and place for density. It can be an important and necessary tool in development. But if proposed, there should be a greater good. We just can’t find it when it comes to this plan, especially when it would set a new Paradise Valley record for development per acre. Paradise Valley has remained the “best small town in America” without a small property like SmokeTree at full potential. And it will remain so. That’s why this absurd plan should be defeated at all costs. No lipstick is available for swine looking for a developer bailout having overpaid for the land. And inertia ought never be a reason to approve a plan. Nor inanity. On average, it takes five second to send or read a text message. To put that in perspective, it also takes about five seconds to travel the length of a football field while driving 55 mph. In 2017, Arizona reported 741 distracted driving related accidents according to the Arizona Department of Public Safety. Yet, Arizona is one of only three states that still does not have a state-law against distracted driving or ban on texting while driving. That’s insane. While the Arizona House continues to debate Senate Bill 1141, also known as the “distracted driving” bill, many other cities are addressing the issue head on. Scottsdale, Phoenix and many other cities throughout the state have taken on the issue, many of which have passed their own ordinances on distracted driving. Last month the Scottsdale City Council, led by Councilwoman Suzanne Klapp, directed the City Manager and staff to look more in depth into the matter. But Tempe’s actions might be the strictest by far. Last month, as part of Tempe’s Vision Zero, the City Council approved changes to the city’s distracted driving laws. Effective immediately, drivers using their phones while driving in Tempe can be issued a citation and fined up to $500. Previously, Tempe’s ordinance required a person to be driving erratically in order to be pulled over. This is a major step-forward. Just one year ago, Dr. Hiral Tipirneni made quite the impression on the West Valley’s political scene. In last April’s special election in the 8th Congressional District, which consists of Phoenix’s north and western suburbs, she lost to Arizona state senator Debbie Lesko by a mere five points. Hiral was the talk of the town. Since that time, however, Tipirneni has been tipping in the wrong direction. Seven months after the special election, she lost to Lesko by 11 points in the November general election. This week, the physician and cancer research advocate announced that she will be relaunching her political aspirations many miles to the east in Arizona’s 6th Congressional District, where will seek to unseat Rep. David Schweikert. We’re perplexed by this decision. We wonder whether Dr. Tipirneni needs a medical checkup to understand what she’s exactly thinking. From what we can tell, she has no ties whatsoever to the 6th Congressional District. According to county records, she lives in Glendale’s Arrowhead Lakes community and her campaign spokesperson even admitted that she still lives in the 8th District. Now, there is no federal law that requires a congressional candidate to live in the district that he or she wishes to represent but give us a break. Can you say “carpetbagging”? We’re pretty confident that Hiral can’t. A few weeks before the official start of the 1991 NFL calendar year, New York Football Giants head coach Bill Parcells abruptly resigned. His decision to step away from the game sent shockwaves across the league. During his eight-year run at the team’s helm, he led a once-moribund franchise to 85 wins, five playoff appearances and two Super Bowl victories. After Parcells’ resignation, a competition commenced over who would replace him. The team’s general manager George Young preferred that veteran offensive coach Ray Handley take over the top spot. Other team leaders preferred that defensive coordinator and wunderkind Bill Belichick succeed the iconic Parcells. Eventually, the Giants tapped Handley for the job. He was the head coach for only two seasons, however, and the choice to go with Handley set the Giants on a course of mediocrity for nearly two decades. Belichick…well, he’s only gone on to become the most prolific and renowned head coach in the history of professional football. We’re not writing that the City of Scottsdale and the early 1990s New York Giants are an exact match, but there is one striking similarity: like the head coach who would take over for Parcells, the next mayor of Scottsdale has big shoes to fill. Mayor W.J. “Jim” Lane has adroitly led “the West’s Most Western Town” since 2008. In just over a decade, Scottsdale has gone from teetering on the edge of financial disaster to being named the best city in the United States to find a job. Mayor Lane is termed out in 2020. His potential successors are now laying the groundwork for their mayoral campaigns. The two legitimate contenders (John Karolzak doesn’t count…his initials, “JK,” are an apt description for his political aspirations) are current Scottsdale councilmembers Virginia Korte and Suzanne Klapp. “The Scottsdale Airpark is on fire.” Not literally (thankfully), but figuratively speaking. At least that’s what the reporters at national commercial real estate news outlet Globest.com have recently written. In the last two decades, Scottsdale Airpark has transformed from a non-descript area of the city with a small general aviation facility and generic office parks to a major Scottsdale economic hub. There are several reasons for this. First, the existing valuable property there is being continuously renovated and the city has not been averse to the mixed-use developments which are breaking ground seemingly by the week. For example, there’s YAM Circle, a 7,800-square-foot shopping center at the corner of Hayden Road and Northsight Boulevard which has replaced the former Harley-Davidson of Scottsdale. The next reason is that it has been very successful in attracting a variety of new businesses from across the world, which in turn reveals why WalletHub named Scottsdale the best city in the country for a person to find a job. The statistics instill excitement for the city’s future. According to the latest forecast report from Colliers International, 59,132 people work in the Scottsdale Airpark and 3,233 companies operate there, in diverse industries ranging from aerospace to hospitality. It even boasts a vacancy rate of less than 10 percent. Last week, we considered Phoenix Councilman Sal DiCiccio and his 2017 campaign slogan “Sal For Solutions,” and how he’s keeping true to it. Nearly two years after DiCiccio revealed that catchy phrase, an equally-memorable campaign motto surfaced for another Phoenix political candidate. At a get-out-the-vote rally less than a week before the Phoenix mayoral election, now-Phoenix Mayor Kate Gallego packed The Churchill in downtown Phoenix with supporters. As she took the stage, the crowd of over 200 started to chant “Kate Will Be Great!” The attendees were so vociferous that they could be heard up and down Roosevelt Row. After topping her opponent Daniel Valenzuela by approximately 30,000 votes, Gallego was sworn in as Mayor last Thursday. Now that she’s taken office, we have no doubt that Mayor Kate truly will be great. We touched on this before, but it’s definitely worth repeating. Throughout the campaign at debates, voter outreach events and community gatherings, Gallego showcased her keen intellect and thorough understanding of issues that impact Phoenix. She could confidently and easily discuss Phoenix’s future as a tech and biomedical employment hub, how more affordable housing can be built within city limits and how to ensure an adequate water supply for the city, all within a 10-minute span. There’s no doubt about this: she’s always thinking. The 42-acre SkySong campus is expanding, the architectural accolades and awards are piling up and most importantly, SkySong’s economic impact is blossoming. There are many things that make our city so special – but few surpass the uniqueness of Old Town. One of the things that make it so unique, especially compared to the downtowns of other cities, is the energy it generates. Our Old Town has become a 24-7 destination for residents and visitors alike. But we need to keep working to sustain its success. The past three years the city has invested an average of $5.4M a year in the Old Town area. That has included everything from sidewalk to streetscape improvements to more aggressive advertising and social media marketing campaigns. During this three-year period, the city has invested more than $3 million alone in special Old Town events like Western Week, Scottsdazzle and the Canal Convergence.